I'm looking for a linux alternative to WinDirStat. I would like to know what is taking up space on my hard drives. A program that works on console and doesn't require a UI is preferred . Based on your issues in installing ncdu my recommendation would be to use du and sort on together. 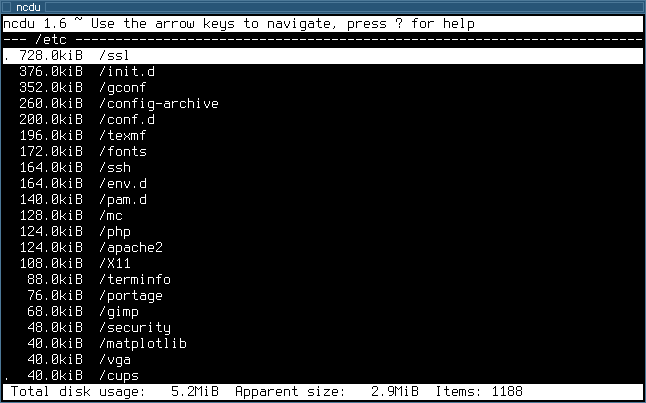 du /home | sort -rn (will search all files/directories under /home and sort them by largest to smallest. You can replace /home with any directory of your choice. 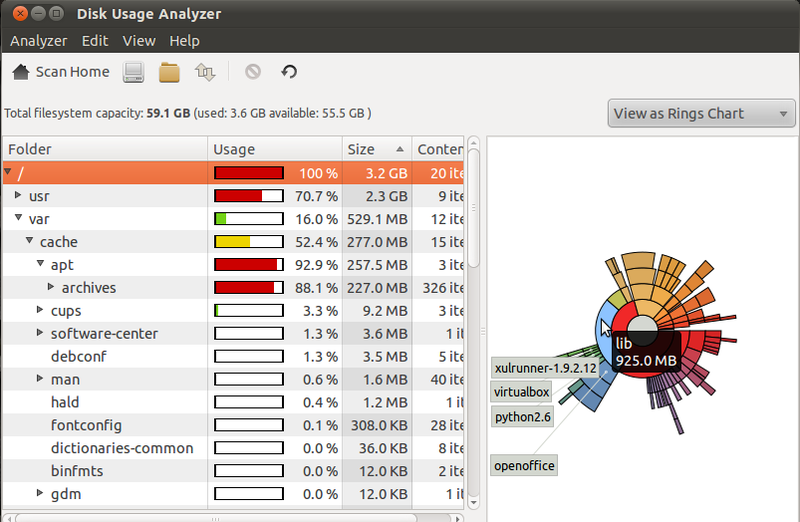 You should be aware that WinDirStat is actually a port of KDirStat, which is a Linux/KDE program. So, if you are looking for a Linux alternative to WinDirStat, you certainly should take a look at KDirStat. It is already packaged in most distros, just install it. Another alternative is FileLight, already cited by Michael Mrozek, and the Konqueror plugin fsview (you can run it standalone from the command-line). It includes a perl script that generates a cache file on the server/console without any need for an UI to be running/installed; transfer it to your desktop machine and view it in the gui client. It's not the most feature rich, but it's run from a single python script so it's extremely portable. If you looked at the about screen on windirstat it showed you that it's based on kdirstat. Breaking it down, du shows disk usage; -s says print the total for each argument (each item in the current directory), -m says show the size in Megabytes. This makes it easier for sort to work; sort doesn't really understand the -h output. The -x ignores other filesystems; this is useful when trying to find space hogs in /var, and /var/spool/foo is a different filesystem. 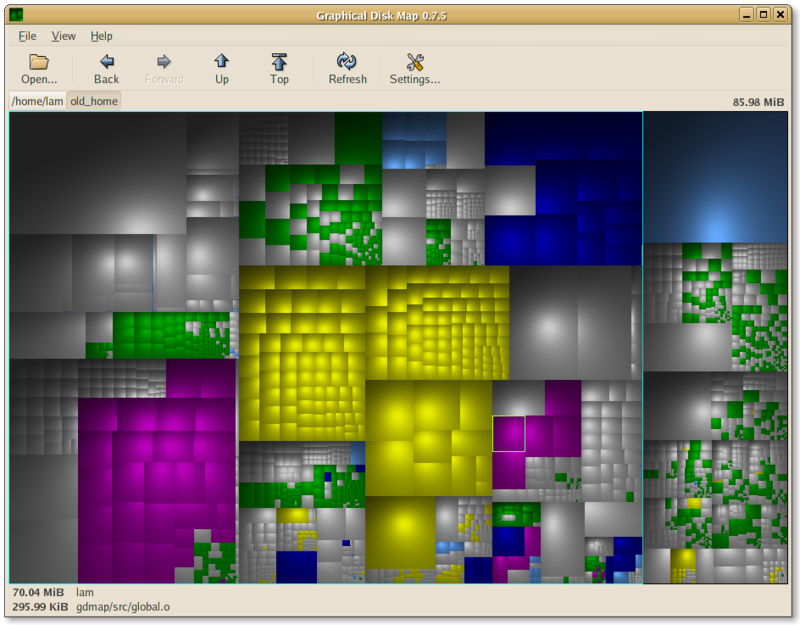 You could also try GD Map, another GUI tool based on treemaps. xdiskusage is very flexible, lightweight with very lean dependencies, easy to compile.. It shows a tree left-to-right that you can navigate with mouse or arrow keys, zoom in (click or enter), hide some parts for a better view, change sort order, number of colors etc with keys or context menu. It's so lighweight that you can use it on a remote SSH link with good performance. In this case I recommend -q command line option to disable the progress bar that appears while files are walked. You can also optionally run du yourself beforehand. One situation is a remote filesystem which is full or near-full. On that system run du -ak | gzip >log_of_disk_usage.txt.gz, fetch the output and run gzip -dc log_of_disk_usage.txt.gz | xdiskusage -aq locally. Or even ssh myremotesystem "cd /filesystem_near_full/ ; du -ak | gzip" > log_of_disk_usage.txt.gz to store the result locally without writing anything remotely. xdiskusage does not offer to modify the filesystem (like move to trash, etc) but you can copy a path to clipboard and paste that into a file manager, terminal etc. It produces a PNG file which you can view somewhere else. It also has a CGI script. Most likely you are not limited to text mode at your local workstation, so it should be appropriate. Not the answer you're looking for? Browse other questions tagged disk-usage or ask your own question. 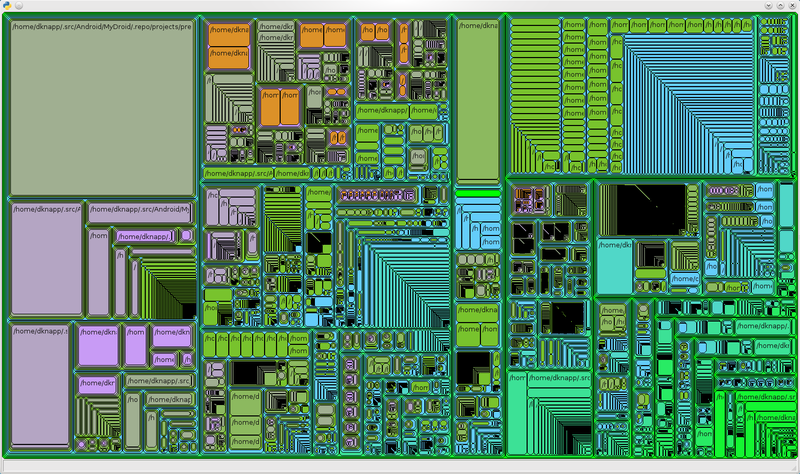 Console utility to know how disk space is distributed? Command line linux alternative for Windirstat/SpaceMonger? How to automatically handle low disk space? How can I understand if my system is using jBoss?